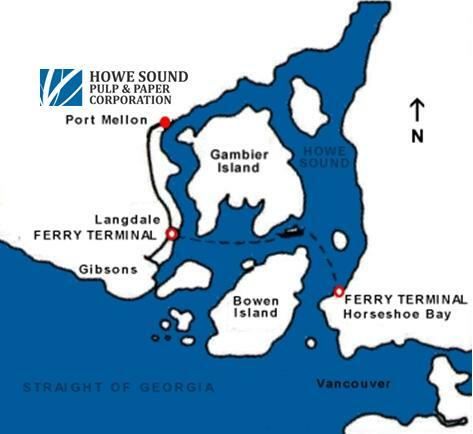 Howe Sound Pulp and Paper is located in Port Mellon, British Columbia, Canada—55 kilometres north of Vancouver on a scenic tidewater inlet in Howe Sound. A proprietary deep-sea port gives us the ability to ship our goods directly to their final destination, maintaining control over product quality. Take the scenic, 40-minute BC Ferry trip from Horseshoe Bay to Langdale. Immediately after unloading, at the first intersection, turn right on to the Port Mellon Highway. Howe Sound Pulp and Paper Limited Partnership is located at the very end of this 10 km road.